"Premier" Oceanfront - Ocean View Kaanapali Beach Condo at Papakea Resort. Spectacular blue water views from your living room and lanai. Gorgeous Newly Remodeled 2nd floor Papakea Resort condo located on world famous Kaanapali Beach. This is an oceanfront complex that offers over 1100 feet of direct beachfront access and 13 acres of lush tropical landscape. 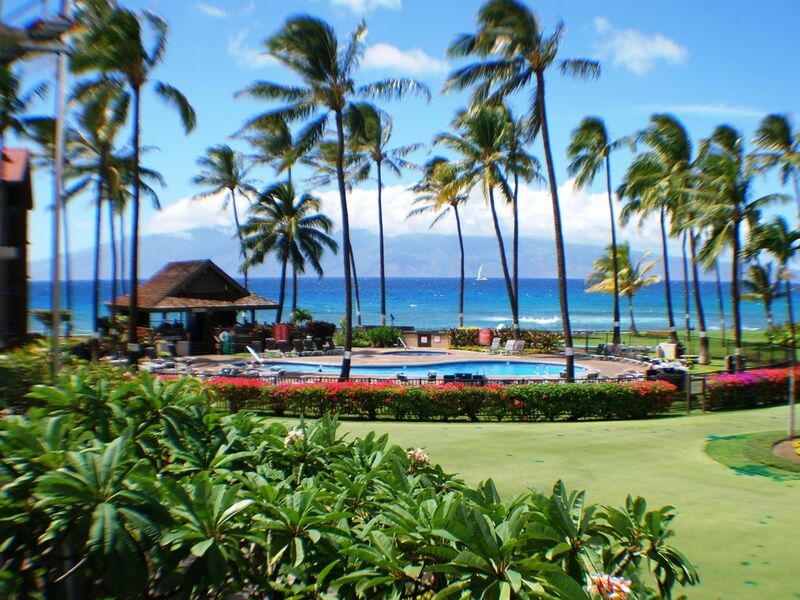 Walk outside the condo, and dip your feet in the warm, tropical waters of the Pacific Ocean, or take a stroll on world famous Kaanapali Beach. Our resort offers 2 pools, 2 Jacuzzis, saunas, 2 putting greens, cabanas, 2 lighted tennis courts, concierge & activity centers, movie rentals, & gas BBQ's for your enjoyment. After a great day of beach fun, relax with your favorite beverage and enjoy a beautiful Hawaiian Sunset from your own private, ocean view lanai. Our Gorgeous newly remodeled 1br/1ba, fully furnished 600 sq. ft. condo is in a premier location and has it's own private covered lanai. Enjoy spectacular views from our condo of the ocean, Molakai, pool area and resort gardens. Our condo was completely gutted and remodeled in 2012 and we installed all new porcelain tile flooring and furniture throughout. Everything is new. The bedroom has a new King bed that is comfortable and firm. Ceiling fan, new flat screen cable TV and lots of closet space are also included. The living room has a sofa sleeper, ceiling fan, large new flat screen cable TV, stereo, and free high speed WiFi internet. We have also installed a large new & quiet energy efficient A/C unit for your enjoyment. Floor Safe, 2 Putting Greens, 2 Pools, 2 Hot Tubs, Cabanas, Tennis Court, Activities Center, Free WiFi & Parking. Elevator on premises. Fitness center next door. J201 is a gorgeous unit! The location, the lanai, the view, and the whole inside is beautiful and remodeled. It would have been nice to take advantage of the cross breeze if the side windows opened, but it was fine. We will always stay in this unit. Our condo has windows in the living area and bedroom for cross ventilation. We also have a new AC for guests to enjoy. Lovely well maintained resort. The condo was fairly well appointed but the furniture was not comfortable. The couch was a broken haida bed that sagged and could feel the bars. The one chair was hard and uncomfortable. Not enough furniture. Ditch the dining room set and add a comfy sectional couch. After a day of walking and swimming we really wanted comfort to stretch out. The toilet didn't always flush. We had to fiddle with it to make it work. We just completed deep cleaning and maintenance of our condo during the first week of December. Our sofa sleeper mechanism was broken by a previous guest when they allowed their children to use it as a trampoline. We purchased a new sofa sleeper, which was delivered last week. The chair is in perfect condition. Our condo has seating for 4 people, which is the maximum occupancy. The toilet flapper chain was adjusted and now works perfectly. Unit was as described, loved the ocean view. Kitchen well stocked with nice updates. Property in great condition. Excellent location, close to shops, restaurants, golf. Mahalo for your stay...come back soon! What a wonderful location and facilities. Staff is outstanding, courteous and professional. Loved every minute and highly recommend it to anyone and will book there again someday I am sure. Condo was adequate overall. Could benefit from upgraded lighting and furniture, especially on the lanai. More information, such as a book of tips, rules, and local attractions would be a nice touch as well. Our condo is completely renovated and has all new interior furniture & lighting. We also have all new furniture on the lanai. The resort office has a large selection of brochures, restaurant & shopping information, and a concierge desk for our guests. They will also assist with reservations. Grant - The unit was as described. Impeccably clean and organized. One major benefit was the supermarket across the street, which was really handy. Who needs to make coffee when JAVA JAZZ is open really early for that caffeine fix and the coffee was superb. The resort was very clean, with emphasis on the pool area being kept in immaculate shape. This resort is right beside the Kaanapali resorts and beach, which have a boardwalk that is great for an after dinner walk and sunset view. The resort is very close to Napili cove for turtle sightseeing as well about 10 minutes outside of Lahaina which is a really funky place as well. Many thanks for allowing us the privilege of using your resort and see you in two years as we are coming back.